I connect to my writing through feelings – what touches me, ignites me, upset me. Emotions and passions as a human being, as a spiritual being. Self-expression that’s relatable and feeds into the human thread. I sometimes plant the seed and spark a fire. I make greeting cards for fun, but I would like to experiment and develop them using technology, textile art/designs and text. I’ve also revamped my trainers with African print! 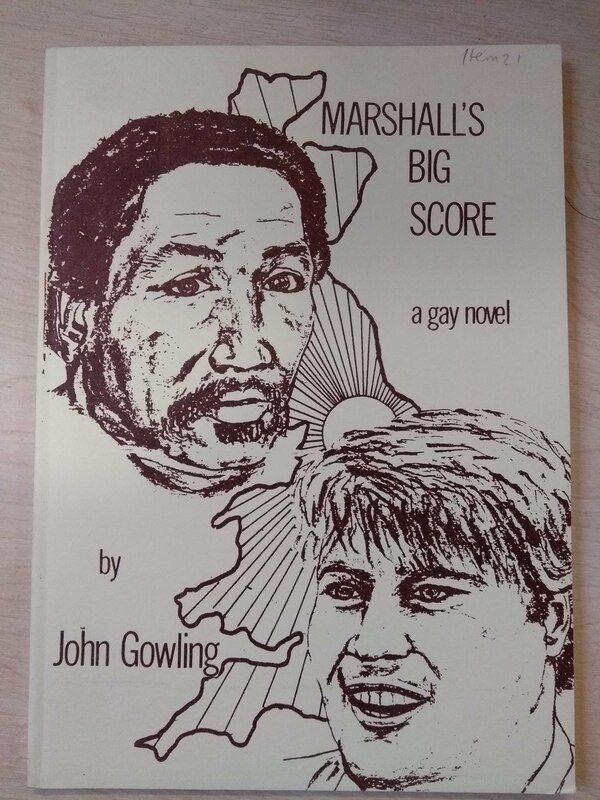 We published your collection, Thoughts, Feelings and Lovers back in 1981. What inspired the collection? Do you think it has further creative potential and have you explored any avenues for this? My experiences: what I had lived through, what I was living then. 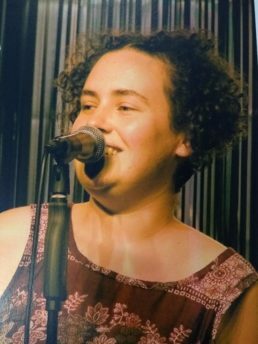 When I had to think, learn, and develop a format, I realised my poems were about the words and the title came through that process. What inspired the collection was Commonword back then and the tight-fisted collective of other female writers like Di Williams and Alisa Cox. It was a time when writers were viewed the equivalent to the geek groups of the technology world. We did performances in the upstairs of pubs when everyone wanted their chance to express themselves on the mic. No real format – just energy, enthusiasm, and booze! Yes, I would like to explore using audio as a future development of the work, as another way to engage/re-engage to an audience in different way. Demographically, I’d like to reach a younger audience and beyond to introduce myself. With technology, anything is possible as there’s a wider audience globally who I can now tap into. You were a writer at Commonword for many years and appear in a selection of our anthologies. What is your best memory from this time and what did you learn about yourself as a writer during those years? Getting my work published was so exciting. I was buzzing, proud and on a high. Meeting different writers and bouncing around ideas. I went to Ireland as a representative of Commonword as part of the Federation of Worker Writers. I felt inspired going to conferences and workshops. The intense arguments! Grabbing opportunities, being nurtured and supported. Meeting, performing and seeing other writers: Jean Binta Breeze, Maya Angelou (thanks to Cathy Bolton), Ben Okri (Lumb Bank first ever Black writers’ week) and the late Maud Sulter (performed at Royal Festival hall London with her and several other writers). Caryl Phillips & Grace Nichols (at Lumb Bank) were also highlights, along with Edward Kamu Braithwaite – I got to see so many Black writers. It was an inspiring, pioneering time within and out of Commonword. So, so many memories. I learnt I have a gift that is naturally given, and that words are powerful. I can communicate what I verbally could not say. Commonword gave me strength to express myself through this way in the deepest darkest times and the lighter times. 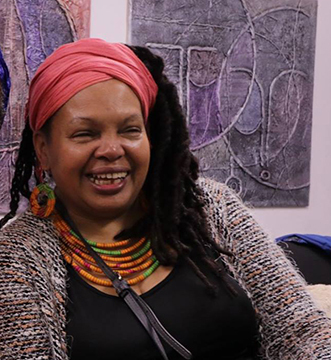 I loved being involved in a Black women’s writer group called Blackscribe with Pauline Omoboye, Angi Weir, Millie Henry, Tina Tamsho-Thomas and later, we were joined by Nailah. The encouragement and support in these times inspired new groups and different directions. Extracts from your Moving Manchester project (2011) interview with Corinne Fowler are included in Postcolonial Manchester: Diaspora Space and the Devolution of Literary Culture. What were your highlights of this project? 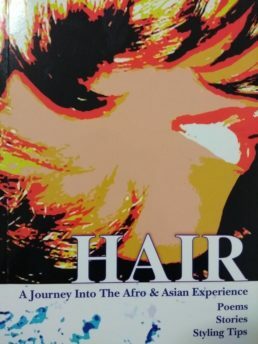 How do you feel about its inclusion in the Postcolonial Manchester book? I think the fact that cultural literacy is included, and a wide range of writing/writers is a record and legacy for the time. That it is important as inclusion of a diversity race showcasing our input, talent, craft. What advice would you give to writers when it comes to approaching publishers and venues with their work? Do your research; know what you want and what suits you. There is so much more out there to choose various paths. It can be challenging and exciting. As for venues, sometimes you do not always get an opportunity to check out the venues beforehand, even the smallest consideration that makes you feel comfortable, relaxed, a stand, a sound check, jug of water can make a difference to your performance and how you connect to an audience. What does the future hold for you in your writing career? I have been apart from writing and audience, so to be re-awoken. To re-connect. To re-establish? to re-create in a different format. To develop. Commonword was part of my life before I even knew that it existed. 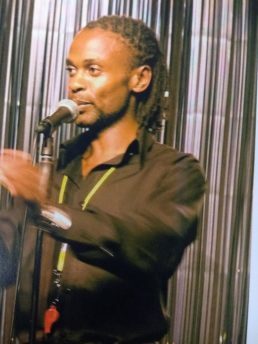 In the early 2000s, I started to explore Manchester’s spoken word scene without realising that many of the poets and writers that I had seen perform were part of Commonword at some stage or another. Almost two decades later, and I find myself working on its archive. I’ve been cataloguing the items, going through old recordings, trying to work out who’s who. I’ve been in touch with some of the writers involved in the 1980s and 1990s to try to piece together the history of the organisation. Commonword came out of the adult literacy movement in the late 1970s and was part of the Federation of Worker Writers and Community Publishers. It is one of only a handful of Fed organisations set up around that time that still exists due of its ability to adapt, change and continue meeting the needs of marginalised writers. Writing by working class people about working class life, writing without pretention. Writing by school children. Writing by women who have experienced domestic violence. Then there are the Black writers. So many of them. Not all from London either. Their number put notions of multiculturalism and inclusivity to shame. Makes you wonder why a lot of arts organisations find it so hard to commission and meet their diversity quotas. Some things really haven’t changed. 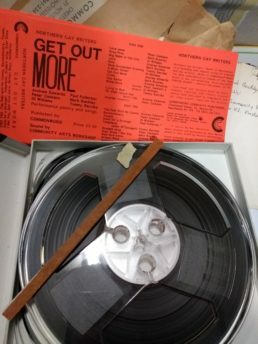 In the box of photos, in a torn envelope, there is a reel-to-reel tape called Get Out More. It was put together by Northern Gay Writers, a group that came out of Commonword before the first Gay Pride took place in Manchester. It’s from 1987. I don’t know what’s on it yet, but there is something comforting and familiar about a bunch of queers getting together to make a recording. Things like this were a staple listening in my twenties. Some of those people are doing the same thing now. I’m hoping it will be shambolic. I can’t wait to find out. Some things have changed. Gay people can get married and we have more Black and Asian people in the media, and more women in public life. But most of them white. And a lot of those fundamental problems are still there. These archives are a measure of progress not just within publishing but in society as a whole. I’m hoping to look at some of these in future blog posts. As part of the archive project, we’re holding a series of reminiscence sessions for writers who were part of Commonword in the 1980s and 1990s which will take place in Spring 2019. Watch this space for venues, dates and times.